The OK Hotel Art Gallery represents work from local Seattle artists by having a new show each month. The featured artist’s opening shows take place during the First Thursday Art Walk in Pioneer Square. At the OK Hotel Art Gallery, we are more than just an Art Gallery. We are a collective of artists who share the vision and desire to radiate the creative soul encompassed within the walls of this beautiful historic building and its occupants. Each month we invite guest artists and musicians from around the metropolitan area to come join us in sharing their latest creative endeavors, creating a vibrant, exciting, and ever-changing ambiance during the art walk. 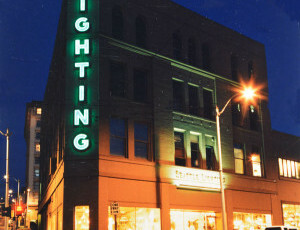 Since 1917 Seattle Lighting has been the Pacific Northwest’s leading source for an exceptional choice of quality lighting fixtures and accessories.